Here is a brief timeline of events that unfolded since 1949 in the Babri Masjid-Ram Janmabhoomi dispute case. The Ram Janmabhoomi-Babri Masjid dispute is a decades-old tussle between Hindus and Muslims. The Hindus claim that it is the birthplace of Lord Rama where a mosque was built in 1528–29 CE (935 AH) by Mir Baqi. Since the mosque was built on orders of the Mughal Emperor Babur, it was named Babri Masjid. The Babri mosque was demolished by Hindu Karsevaks on December 6, 1992 in Ayodhya. The country witnessed massive riots following the destruction of the mosque, in which over 2,000 people were killed. A specially constituted bench of Chief Justice Dipak Misra and Justices Ashok Bhushan and Abdul Nazeer is currently hearing a total of 13 appeals filed against the 2010 judgment of the Allahabad High Court in four civil suits. The high court had in 2010 ruled a three-way division of the disputed 2.77 acre area at Ayodhya among the parties -- the Sunni Waqf Board, the Nirmohi Akhara and the Lord Ram Lalla (infant Lord Ram). December 1949: An idol of Lord Ram is placed inside the Babri Masjid, after which police lodges an FIR and the city magistrate seizes and locks the property. January 1950: Gopal Singh Visharad files a civil suit in the Faizabad court demanding to unlock the Babri Masjid premises and start regular prayers. Ramchandra Das Paramahans, the Mahant of Digambar Akhara and Nirmohi Akhara later approaches the court with the same demand. February 1961: Uttar Pradesh’s Sunni Central Waqf Board challenges the three suits filed by the Hindus, declaring Babri Masjid as its property. Hashim Ansari and five others join the case through separate pleas. February 1986: Faizabad District Judge Hari Shankar Pandey orders unlocking of the Babri Mosque in favour of Hindu parties, and allows worship. The Babri Masjid Action Committee is formed in the same year. 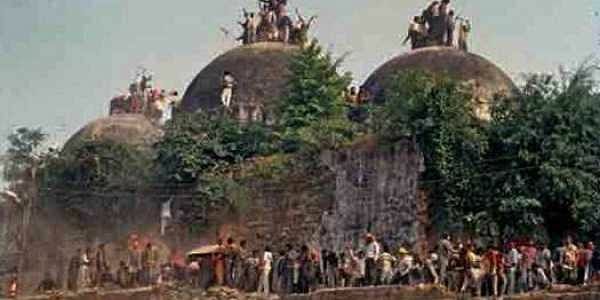 1989: All cases related to the Babri Masjid-Ramjanma-bhoomi title suit are transferred to the high court. Triloki Nath Pandey also becomes a party by claiming to be Ram Lalla’s ‘best friend’. December 6, 1992: Babri Mosque is demolished. December 12, 1992: The Narsimha Rao government sets up the Liberhan Commission to investigate the case. 1993: The Liberhan Commission begins its probe. CBI takes over and files a chargesheet against BJP leader LK Advani, and 19 others, who led the rath yatra to Ayodhya, and is accused of goading kar sevaks into pulling down the structure. May 2001: The special court drops criminal conspiracy charges against L K Advani and MM Joshi. February 2002: Tension in Ayodhya as the Vishwa Hindu Parishad (VHP) is adamant on Shila Pujan to construct the Ram temple. April 2002: A three-judge bench of the court begins the Ayodhya title suit hearing. 2003: In a survey requested by the High Court, the Archaeological Survey of India (ASI) finds evidence of a temple under the mosque. Muslim groups dispute the findings. September 2003: The CBI court rules that seven Sangh Parivar leaders should stand trial for inciting the Babri Masjid demolition. LK Advani, by now the deputy Prime Minster, however, is spared. June 2009: The Liberhan Commission submits its report, holding 68 people guilty of the demolition of the 16th century Babri Masjid. 2011: All three sides — Nirmohi Akhara, Ram Lalla Virajman and Sunni Waqf Board — appeal against the verdict in the Supreme Court. February 2016: BJP leader Subramanian Swamy appeals to the Supreme Court for an urgent hearing to decide the title suit. March 21, 2017: Hearing Swamy’s petition, the three-judge bench says the parties involved should try and reach an amicable settlement out of court. The Supreme Court is ready to mediate, says the Chief Justice of India. Supreme Court asks the CBI court to commence a day-to-day hearing in trial within a month of the order and wind up the case by 2019, delivering the verdict. May 20, 2017: Special CBI court in Lucknow summons six accused including RV Vedanti, BL Sharma, Champat Rai Bansal, Mahant Nritya Gopal Das, Mahant Dharam Das and Dr Satish Pradhan. All the accused except Pradhan appear in court and are granted bail, with the next date of hearing set for May 25, 2017. May 24, 2017: Satish Pradhan appears in the CBI court, Lucknow and gets bail. May 25, 2017: Six accused, including Vedanti and five others, fail to appear in court for the framing of charges, and are asked by the CBI court to appear on May 30 beyond which no exemption will be allowed. May 26: The Special CBI court summons six BJP leaders including LK Advani, MM Joshi, Uma Bharti, Vinay Katiyar, Sadhvi Ritambhara and Vishnu Hari Dalmia, accused in the case (FIR 198/92) to appear before it for framing of charges. All six fail to appear and are directed to be present on May 30, 2017. May 30, 2017: All 12 accused named in the FIR no 198/92 for inciting the mob and conspiring to demolish the Babri Mosque appear in the Special CBI court in Lucknow Court. Additional charges of conspiracy are framed under Section 120 B of IPC against them. August 8, 2017: The Uttar Pradesh Shia Waqf Board proposes in an affidavit to the Supreme Court that a new mosque be built away from the disputed site in Ayodhya. The Shia Waqf Board claimed, in media reports, that the 16th century Babri Masjid was a Shia waqf (endowment) and that the Sunni Waqf Board, which has been a party to the 70-year-old Ramjanmabhoomi-Babri Masjid title dispute, were "mere interlopers" led by “hardliners, fanatics and non-believers” who do not want an amicable settlement with the Hindu sects involved,. August 11, 2017: Supreme Court to start final hearing on December 5. The court directs the Uttar Pradesh government to translate the case documents running into more than 9,000 pages (523 documentary exhibits) within 12 weeks. The documents include scripts and records written in various languages ranging from Pali, Arabic, Persian, Gurumukhi to Urdu. November 20, 2017: Uttar Pradesh Shia Central Waqf Board files an application in the Supreme Court seeking settlement of the Ram Janmabhoomi-Babri Masjid dispute. December 5, 2017: The Supreme Court commences hearing in the Ayodhya dispute. After hearing arguments from the defendants and Additional Solicitor General (ASG) representing the State of Uttar Pradesh, the apex court fixes matter for further hearing on February 8, 2018.